Two years ago, I was miserable. Not only I felt weak because I could not fight with the tuna long enough to catch it (I had to have someone to take my rod), the line had to break just before catching it. This year, I was determined to fight with a big tuna by myself. And that is exactly what I did on June 24th 2018 on a boat near Kume island. Toward the end of the day of fishing, a tuna was hooked on my fly. The reel spit out 100 yards of PE in a matter of 30 seconds. I knew I got a big one. During the 1 hour of fighting with the tuna, the thought of quitting was tempting. But, I didn’t. I wanted to take the picture of the tuna and myself with a big smile and no hint of regret. The picture taken after I caught the tuna was the “featured image” of this blog post. This was exactly the picture I wanted to take. I was happy to have been able to take this picture of me and my tuna. Naha airport. I had to transfer from here to Kume island. Okinawa noodle at Naha airport. Slightly different from ramen noodle. This was also one of the pictures I wanted to take. One of the fishermen I went with had his rod broken, but kept fighting. Orion beer tastes really bad in Tokyo, but tastes absolutely awesome in Okinawa. Tuna we caught turned into Sushi. The view of the beach from the hotel we stayed. Spent 2 hours fishing here, but no luck. The only place you can catch lake trout in Japan is Lake Chuzenji in Tochigi prefecture. I tried catching one 3 years ago, but had failed. I saw one of my friends on Facebook catching lake trout on fly from boat. She also uploaded a video of her catching one, so I did exactly what she did in the video. First, you need to know where the water is roughly 10-15 meters deep. Then you cast your full sinking type 6, 8wt line. You (or your watch) count 60, and then start retrieving really fast. Your fly must hit the very bottom which means your fly must be keeled. I used TMC 708 and tungsten beads head to tie my keel fly. The bottom is full of algae, so your fly color should match it (olive color) so the fish won’t feel the fly is strange even if you got some algae on your fly. Also, the season must be sometime in April – May. My feeling is June is too late already because the hotter it becomes, the deeper lake trout stays. In June, the fish will probably stay so deep that your fly line won’t be able to reach. This year might have been the last chance to catch the lake trout easily because lake trout fishing is still 100% catch & release since the nuclear accident in Fukushima in 2011. I have a feeling the embargo might lift next year or the year after. If it does, lake trout will go back to being a “dream fish” in Japan. 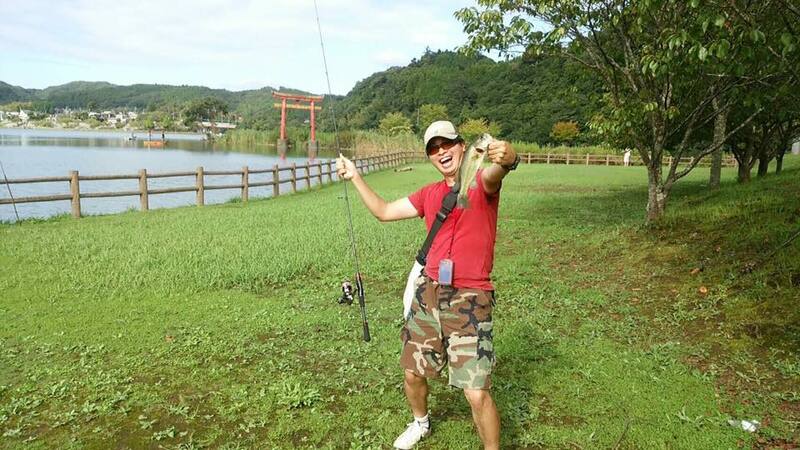 Black bass fishing is extremely popular in Japan. When I watch a fishing channel, one third of all programs are about bass fishing. The history of bass fishing in Japan started in 1925 when Tetsuma Akaboshi, a University of Pennsylvania graduate, brought 90 black bass from Santa Roza, California, and released them in Lake Ashino in Kanagawa prefecture. As I wrote in my older post, I had a terrible time bass fishing in winter. Ever since then, I had not tried bass fishing on fly for a long time. Last summer, I finally bought my first bass lure tackle, and caught my very first bass. This was almost 10 years after my first trial. 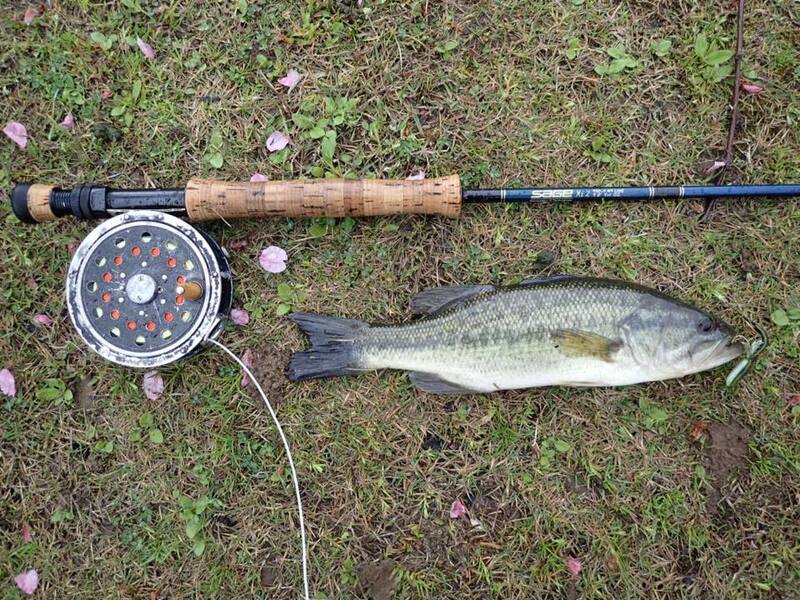 Then, I tried a pond fishing with my lure tackle and I was able to catch some large mouth bass, as well. I said, ok, I think my bass-fishing curse is lifted. I’m ready to try my bass on fly. But, I wanted to carefully choose the date I was going to go. On the day I had planned to go, it was not only very cold, but it was also raining. So, I canceled my original plan, and waited until the next week. My fishing friend told me the water temperature of a lake was to rise after 3 days of warm days. I had re-planned to go on Apr 8th. Then, it was very warm on Apr 5, 6, 7th. I was ready, and the lake and the bass must’d been be ready for me, too. I went there in the early morning. Although I saw some fish right after I started fishing, none of the bass attacked my fly. I started becoming a little uneasy. Is my black bass curse still in effect? So, I moved to this small island where it was surrounded by reed. I remembered somebody told me the bass hid in the reed. So, I casted my zonker fly to where the reeds were, and this bass was kind enough to take a bite. My very first bass on fly. As you can see in the picture, the cherry blossom was still blooming. I enjoyed the scenery and the bass fishing. It was a nice perfect spring day. Catching salmon in the rivers is strictly prohibited in Japan. If you want to catch a salmon, you have two options. Catch them in the ocean before they enter the river. I tried (1) in Hokkaido in 2015, but I failed. I tried (2) in 2016, and here’s the report of it. In many rivers in Japan, many fisheries union conduct scientific research on salmon whereby they allow fishermen to catch salmon so they can make records of where they could catch salmon. The research usually happen from September to November. On this website, you can find rivers that do these researches. (Get somebody or me to help you find out whether there is a river that does the research near you.) You need to send a letter to apply, and you are lucky enough, you will get selected to join. 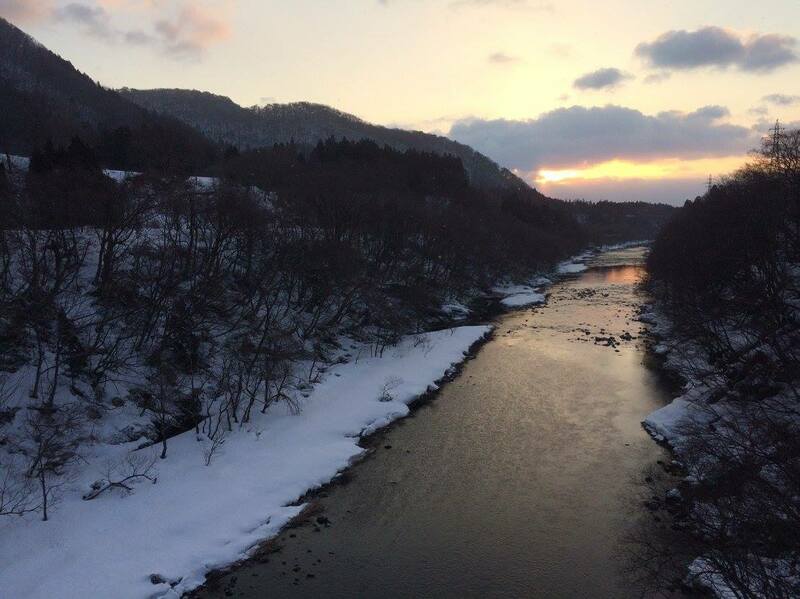 I applied to join a research at Sagae river in Yamagata prefecture. So, on Oct 27th, 2016, I drove 6 hours from Kawasaki to get to Sagae River. I brought my 8 weight rod and a Tibor Everglades. My fly line was Rio’s versa tip. I wasn’t sure how deep the river was, so I prepared Versa tip line so I can adjust to the depth of the water. What I had heard about salmon fishing was that it’s very difficult and you are lucky if you could catch one. To my surprise, Sagae river was very crowded with salmon. It didn’t take a lot of time before I caught my first fish. Male fish was extremely powerful, and I had to fight for 30 mins before I could land one. Please note that in most of the research salmon fishing, you need to stop fishing after catching 3 female salmon. To be very honest, I didn’t like salmon fishing that much because 1. salmon are not supposed to eat anything once they come into the river. If your fly was in a salmon’s mouth, it’s not that you had them strike, but it’s just that it happened to go into their mouth by accident, 2. once female salmon spawn, they lose estrogen (female hormone) and their body start rotting quickly. One time, I caught a female salmon right-side of which was already dead. (Its right eye and skin had come off.) You see dead salmon everywhere too. Perhaps next time I do salmon fishing, I should probably go there earlier in the season before the female spawn. After my fishing friends and I spent 4 hours driving and 5 hours walking to get to a white spotted char’s heaven in Shizuoka prefecture at the end of April, I realized how fun it was to get to such a place. 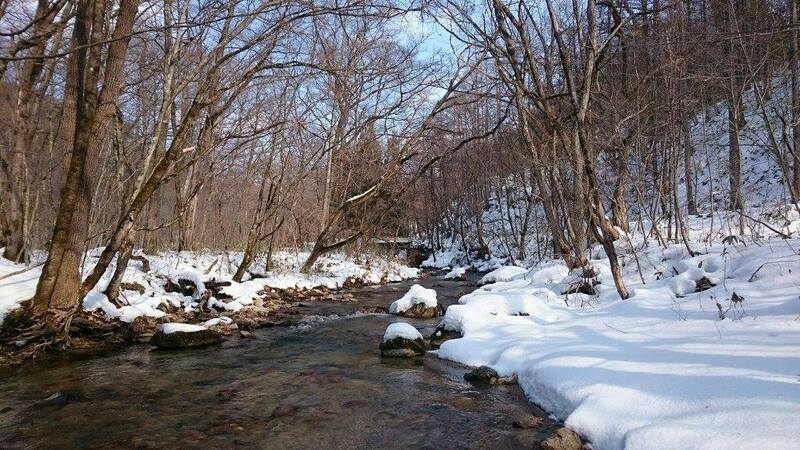 So I planned to go to a similar secluded river in Tanzawa by myself. 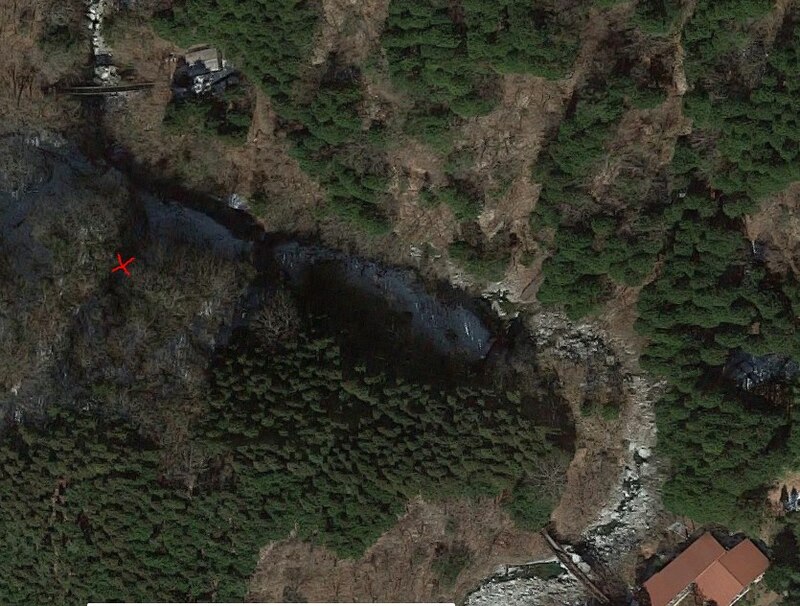 On May 3rd, I arrived at a parking lot near the hiking path where I spent 2.5 hours to hike up. At the end of the path, there was a lodge behind which you could enter the river that I planned to fish. What I didn’t know was that before entering the river, the path continued a little more so you could enter the river just upstream of a small dam. I entered the river just downstream of the dam, so I had to find a way to detour around it. 1. There’s no one around. How do I let someone know that I need help. 2. If in case I cannot contact anyone, I am confident that my fishing friends will start wondering why I’m not back from a 2 day trip after 3 days. So, how can I survive 3-4 days before my fishing friends contact police and rescue team can find me. So I quickly took my cell phone from my bag, and confirmed there was no reception. I cannot directly contact police to ask for help. Then I took the whistle and started blowing. For a while, I blew the whistle, but I could not get any response. So, I had to think about how I would survive for the next 3-4 days. Immediately, the following thoughts came to my mind. – Drinking water: I have a water purifier. The river is 200 meters away. Need to crawl, but check. – Food: Got 2 days worth of food in the bag. If I eat them a little by little, I can survive for 3-4 days. Check. – Wormth: It’s only about 1,000 meters in altitude. It won’t rain for a while. I have a sleeping bag and a water-proof sleeping bag cover. Check, I’ll be okay. So, if everything went well, I knew I would survive this disaster. I started crawling, and I also blew whistles and yell “Somebody! Help!” while taking a break from crawling. I was surprised at the volume of my own voice. I learned that when the volume of one’s voice would decide life/death of his/hers, it could become quite loud. After crawling for a while to get to the river, I started hearing some voice. The whistle and yelling saved my life. The people from the lodge came and found me. They contacted police and the rescue team for me. A police officer came about 1 hour later, and put a harness on me. After the rescue team of about 10 men arrived, they tied ropes to the officer and my harness so neither of us would fall while the officer would carry me on his back. After escaping from the river and the river bank, I got on the rescue team’s car to go back to the parking lot where an ambulance was waiting for me. After arriving at the hospital, they took an X-Ray of my ankle. I thought I only sprained it, but the X-ray revealed that the bone was broken. 1. Don’t go fishing alone. The surgery has been confirmed to happen on May 16th. I will not be able to walk for 1.5 months, and then because of iron plates and bolts, I will not be able to go river fishing / climbing for 6 months. I will probably focus on fishing bass in the next 6 months. From the end of April to the first week of May is called “Golden week” in Japan. You get a few days off due to national holidays. If you add a couple of personal leaves, you get one whole week off. So, my golden week started two days ago on April 29th, so me and my fishing friends decided go to white spotted char (Iwana)’s heaven in Shizuoka prefecture. It took a lot of time. 4 hours driving, and another 5 hours walking upstream the river to get to where we set up our base camp. On the way to get there, there were many dangerous spots where we could fall and die. By the time we got there, we were exhausted, but the thought of big size white spotted chars opening their mouths waiting for our fly / lure / bait, we could not help but to grab our rods and start fishing. So, here’s the pic gallery of our trip. 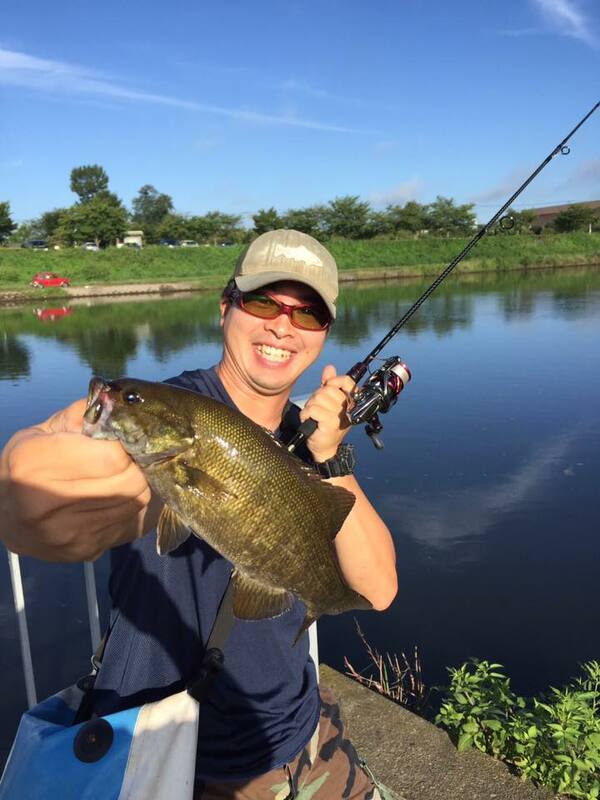 As I discussed in one of my posts, because fishing is an extremely popular hobby in Japan, you get a lot of competitions when you go out for fly fishing. If you would like to get to a place where you get no competition, you need to take an extreme measure to get there. This can be achieved in a several ways. The method I can think of from top of my head right now are: 1. Get to a place where it takes a lot of time to get to, 2. Get to a place where it takes a skill to get to, 3. Both (1) and (2). I’ve done (1). It takes a lot of time to get to Noro river because you need to spend 3 hours driving, another 1.5 hours on a bus, and another 4 hour on hiking. Still, you saw a few competition. Then I read a book written by a journalist about the rivers that are full of shaku-iwana, or white spotted char sized larger than a foot. In the book, most rivers that are introduced are not reachable without a climbing skill. That’s when it hit me that to acquire a climbing skill takes not only a lot of commitment, but a friend who has as much passion to search for fish as you do. Fortunately, one of my colleagues is also interested in learning climbing. So, before my colleague took a climbing lesson, I went ahead and took a climbing course at West Tanzawa. The trip was extremely exhausting and dangerous. I saw how climbing would repel many fishermen. I should’ve been to a climbing gym first before I went ahead and got to a natural climbing environment. 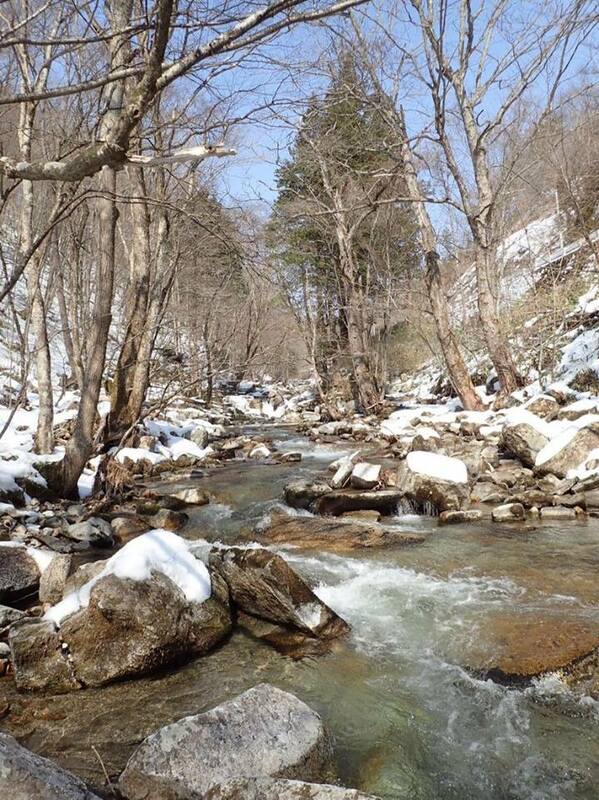 For the past two years, I spent the trout opening weekend (1st weekend in March) in Izu peninsula. 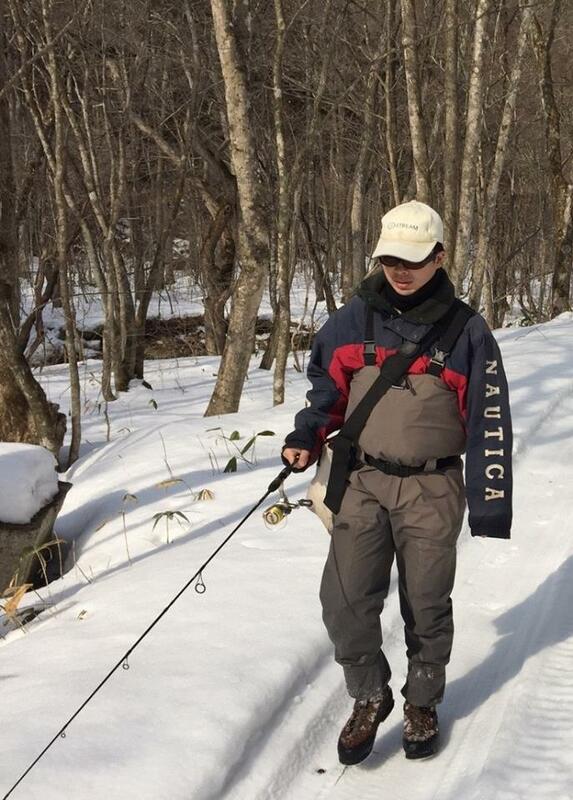 This year, my colleague wanted to go to Tohoku area for the trout opener because he heard the news on the internet that the fishing is already really good. So, we spent two hours partying, drinking beer, and talking about trout fishing on a bullet train to arrive at Tohoku area. 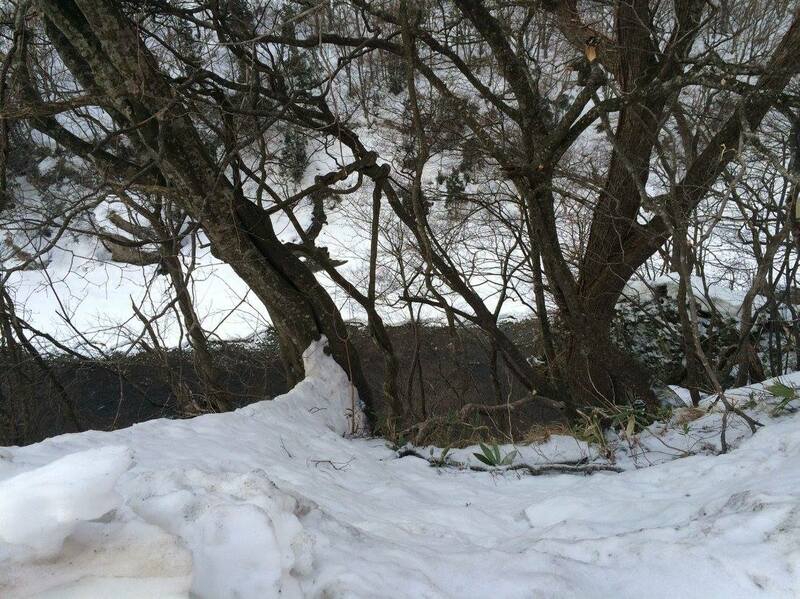 Tohoku area is famous for its really cold whether and a lot of snow. 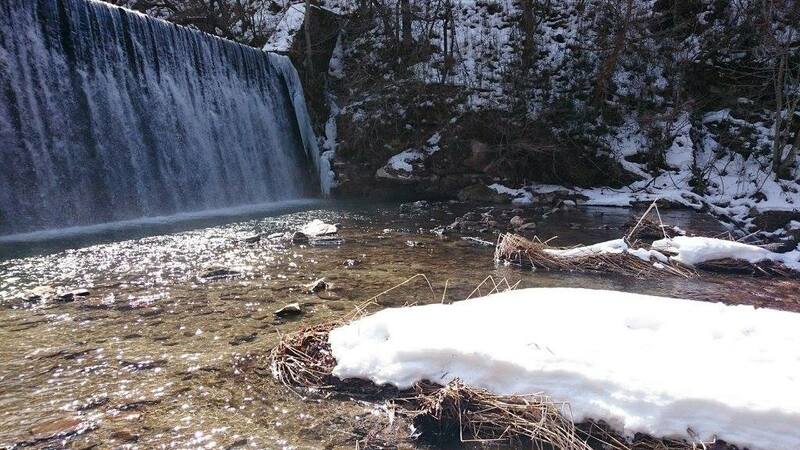 When we arrived at the river, we noticed there were still a lot of snow left. That means the temperature of the water is close to 0 degrees Celsius. I would’ve written more about the trip if I caught any fish. It turned out the fishing was really tough. Three of us caught only one fish during the two days of fishing. I brought a dry fly tackle and a lure tackle. I noticed there was very little chance to catch any fish with a dry fly because it was too cold for the flies to hatch and also too cold for fish to rise. I quickly switched to my lure tackle to cast spoons, but still no chance. So, what we started doing was to enjoy food. Tohoku area’s got great food and sake! I had the best lamb bbq, sashimi, sushi, and sake ever! This time, DA tried his new 10ft 3wt nymphing rod. His first fish of the year was cherry trout. It was interesting because once he started using a heavy woolly bugger as the anchor fly, he started catching a lot of fish! The fish totally loved the black bugger. At one spot, a huge white spotted char (iwana) broke his line 3 times. I had a tough time for a while with my dry flies, but I finally caught this pretty good size rainbow trout. DA told me he wanted to catch amago, so we’ll probably go to Izu peninsula in April.